Sean Sullivan working for feared Auckland gang the Headhunters.? Sean Sullivan used to fight for big paydays in the ring now he's battling to recover other people's debts.And the 40-year-old, who pushed two-time world super middleweight champion Anthony Mundine to the wire in their 2003 fight this week revealed to Sunday News he's finally throwing in the towel on his 18-year career. The never-say-die fighter's decision comes almost nine years after doctors and the boxing fraternity first suggested it. "I don't want to make some big announcement but realistically I've got to the stage where the money really isn't there any more," Sullivan said. "You don't want to price yourself out of the market ... but I don't really go looking for fights any more and I guess I'm happy to say I'm calling it a day. I have retired. "Sullivan was initially reluctant to confirm his new occupation to Sunday News. "Don't mention the debt collection to be honest," he said. The father-of-two feared the admission would only fuel speculation he's working for feared Auckland gang the Headhunters. "The boys in blue think I'm prospecting for the Headhunters," he said. "I've never, ever, ever, been interested in joining any gang. And I've never prospected for any gang, or been interested in it. I wish they (police) would just get their facts right. "As soon as you go to that gym (the Headhunters boxing gym in Ellerslie, Auckland) they say you're associated with the Headhunters and ... you're involved with organised crime. That's not me." Sullivan admitted he had previously, inadvertently, worked with some Headhunters doing debt collection for former employer Kimball Johnson an underworld heavy turned country and western singer known as the "enforcer" who died of cancer in 2007. "A couple of the lads that worked for Kimball probably associated with the gang. "So that's where it's fallen into place for the police. But as I said, I'm virtually a gang of one and that's me. "Johnson was a highly respected underworld figure. His coffin was carried to his funeral in March by Headhunters and a death notice was placed by "all the brothers from Paremoremo Maxi and west" and signed by a Hell's Angels member.Sullivan, like Johnson, has found himself on both sides of the law.For just over two years Sullivan was a police youth worker in Mangere but his provisional contract was not extended in 2003 after police took issue with who he was associating with. Some of his boxing supporters were gang members.He then started working for Johnson.Last year Sullivan was acquitted along with another debt collector of kidnapping a car dealer and trying to extort $21,700 from him.He is currently before the courts on fraud charges. In July 2007, another newspaper reported Sullivan was a Housing New Zealand Corporation (HNZC) tenant who was sub-letting his taxpayer subsidised Mangere home for a $77 a week profit.It was claimed Sullivan who owned a holiday home in Russell at the time paid $133 a week for the state house, despite not being eligible to have one in the first place, and charged his tenants $210 a week.When the tenants allegedly applied for a state house and were told they were already living in one. Sullivan said he could not comment on the HNZC case, as it was before the courts.HNZC told Sunday News Sullivan faces two charges of using a document with intent to defraud between 2000 and 2005. HNZC is seeking $34,422 from him and the case is back in court next month.Sullivan said the kidnapping and extortion case should have never made it to court. "I was found not guilty like I should have been from day one. (It) ruined my life for that period. I was on bail for two and a half years. They took my passport away so I couldn't travel. And I was tarnished with that brush. "Sullivan told Sunday News he was a "very successful" debt-collector and operated by "word of mouth".He said he got "a lot of (debt collecting) skills from Kimball and some of his colleagues".But he said he did the job by the book not by bashing people into submission. "It's knowing how to put payments in place and organising time arrangements and stuff like that," he said. "Sometimes you've just got to pursue it and just not give up. "In a death-bed interview in March 2007, Johnson talked openly about his method of collecting debts. In one incident he bought a $17,000 debt off an elderly couple who appeared on TV show Fair Go, then hunted down the conman. When he refused to pay, Johnson beat him to a pulp hitting the man with a chair until it broke, then used two others.Johnson who also told the interviewer he once bit someone's ear off in a fight was charged with causing grievous bodily harm but the charge was dropped when his victim failed to appear in court.Sullivan said he had got into doorstep fights with debt-collection clients. But that only happened when he was repossessing chattels such as fridges, washing machines and beds something he no longer does. "I don't mind repossessing someone's car because they can just catch public transport to work. They can walk to work, they can cycle to work, or whatever," he said. "But when you're taking someone's fridge or freezer, that's what they use to feed their families and it's harder ... the old heart rules the head. "Sullivan has a five centimetre scar on his left cheek from "some no-neck" who attacked him during a job. "I went around there with my boss from the finance company and this gentlemen tried to attack the boss so I stepped in to help him and (the debtor) put my head through a window it came out the other side," he said. "I recovered from that and I think he wished he never attacked the boss after that. It was more than just a knockout. But the writing was on the wall after that ... no more chattels. 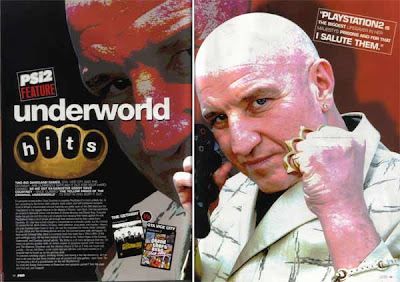 "Sullivan, who when Sunday News met him looked more like a suburban dad on holiday in velcro rubber sandals, three-quarter shorts and T-shirt than the brawling boxer he's known as, said he has been "more blessed than most" in his fight career.He has previously held the light-heavyweight, super-middleweight, welterweight and middleweight national titles and been ranked as high as No7 in the world's welterweight division by the World Boxing Association and the International Boxing Federation. He pushed world-ranked Danny Green so hard in 2004 that the Australian had to be hospitalised after the fight.Green had to have three litres of intravenous fluid to counteract the dangerous dehydration and exhaustion he got trying to knock out Sullivan, who is known for his extreme fitness and always finishing bouts on his feet. "There's a lot of `what ifs' and `what could of beens'. A world title bout would have been great, but I fought Mundine and Green," he said. "I fought for the Commonwealth title, and I had a month to lose two stone and I did it. I went over there and I won the fight. So I've done alright. "But Sullivan has not won a fight since 2003 and could not remember his boxing record or who his opponents were in his last two fights at the Headhunters Fight Nights in May and December 2007. "I just lined up, got in there and did the business. They gave me a week's notice, but I'm not exactly going to say no to WD (Headhunters boss Wayne Doyle)," he said. "I wasn't in the best shape. I was drinking beer and enjoying life. "Sullivan was warned to quit boxing as early as 2000 after collapsing in a post-bout sauna.Former trainer Karl Turner had to resuscitate the fighter, who had stopped breathing and had no pulse.Later that year, a neuropsychologist recommended Sullivan never enter the ring again. Tests concluded that his brain function was abnormal.Sullivan who still coaches continued to fight. But Father Time looks like it has at last beaten arguably the toughest fighter to ever come out of New Zealand. Or maybe not! "I'm not fussed about fighting but if I get a good offer and they give me time to prepare ... it'll be on." Irish police believe they now know who killed rugby player Shane Geoghegan and expect to charge the suspect this weekend.Last night, officers were concentrating their inquiries on a young man who is in custody in Limerick. He was arrested earlier this week in connection with the murder. The brutal killing shocked the country and led to a major crackdown on Limerick's criminal gangs.The development follows an intensive week of investigations where 120 detectives, working in 36 teams, repeatedly interviewed 16 people (eight women and eight men). Eight individuals remained in custody in stations in Limerick and Clare last night. Mr Geoghegan (28) was shot dead by members of the McCarthy-Dundon gang, in the early hours of November 9. The gunman mistook him for a rival member of the Collopy gang. The prime suspect is a 23 year old from Dublin and is well known in criminal circles. He moved to Limerick and is well connected to senior members of the McCarthy-Dundon gang. He was recently arrested by gardai for transporting drugs into the city from Dublin and has appeared before the courts in connection with it. At a recent court appearance, members of the McCarthy-Dundon gang, wearing bullet proof vests, waited outside the court buildings to transport him away.It is expected that the young man will appear in court within 24 hours in connection with the murder.Mr Geoghegan, captain of Garryowen thirds team, was walking home from a friend's house in the Kilteragh housing estate, Dooradoyle, when he encountered the gunman. He ran for his life, but was cornered in the back garden of a neighbour's home and gunned down, with one bullet striking him in the head.Limerick's most senior garda officer, Chief Supt Gerry Mahon, described the case as one of the most significant investigations to take place in the division.Investigating detectives are also attempting to bring a number of other people who, they believe, were also involved in the murder, to the courts.Fifteen of the 18 individuals arrested and questioned so far are from Limerick and some are members of the McCarthy-Dundon gang. Another member of the notorious gang, who is also suspected to have had a major role in the murder, remains on the run in London. He fled Limerick after the shooting and a bench warrant is out for his arrest in relation to another matter. John Gotti's Bergin Hunt and Fish Club crew are in jail or dead. John Gotti's Bergin Hunt and Fish Club crew are in jail or dead.With the arrest this month of reputed Gambino crime family hit man Joseph Watts, only three members of Gotti's crew remain alive and on the street.Reputed soldiers Ignazio (Iggy) Alogna, Michael (Mikey Gal) Guerrieri and John (Jack) Cavallo are survivors - and schemers. They've struggled with serious illnesses and staying on the right side of the law. "They don't have pensions to live on," pointed out Bruce Mouw, the former supervisor of the FBI's Gambino squad. "These old guys will scheme until they die. "Alogna, 75, a widower raising a grandson in Pennsylvania, once held the rank of capo but was busted down to soldier for trying to extort a businessman without permission. "There's not going to be anything from this end, you know better than that," a man who identified himself as Alogna's son told the Daily News. Long Island resident Cavallo, 60, beat a rap in 2007 after his lawyer persuaded a jury the feds nailed the wrong "Jack" for running a gambling parlor.Last year, 82-year-old Guerrieri got permission - because of his deteriorating health - to stop reporting to a probation officer after a gambling conviction.The crew's glory days were the 1970s and 1980s, when Gotti was a charismatic thug worshiped by his underlings.Gotti inherited the club on 101st Ave. in Ozone Park from Gambino capo Carmine Fatico. It was named for Bergen St. in Brooklyn, but misspelled. "The crew was remarkably loyal and disciplined," said a knowledgeable law enforcement source. Of the core group, only Gotti's so-called "adopted son," Lewis Kasman, turned rat. The inner circle included Gene Gotti (jail); John Carneglia (jail); Edward Lino (slain); Sal Scala (died recently in prison), and Anthony (Tony Lee) Guerrieri (dead).Other confidants included Angelo Ruggiero (dead); Anthony (Tony Roach) Rampino (jail); Vincent Artuso (jail); Ronald Trucchio (jail); Thomas (Tommy Sneakers) Cacciopoli (jail), and Charles Carneglia (currently on trial).The club's brick facade is intact, and the building houses a medical supply business and dog groomer. "After Gotti died [in 2002], people started coming by and taking pictures," said Pedro Severino, owner of PSC Medical Supply. "Last year, three old guys came in a black Lincoln Town Car with a driver. They came in and looked around talking to each other, and then they left. "Guerrieri summed up how much that old gang meant to him at a bail hearing where he refused a judge's order to stay away from wiseguys. "I don't know no doctors or lawyers," he said, according to the Web site ganglandnews.com. "Who am I supposed to hang out with? Send me to jail. I can talk to all my friends in jail. "His wish was granted, but three days later Guerrieri changed his mind and agreed to abide by the bail conditions. Ricardo Fanchini is one of the world's most well-connected gangsters, with mobster friends as far afield as Moscow, New York, London, Antwerp, Naples, Poland and Israel. "He was like the CEO of crime and used to organise crime summits in Austria, where people from the Camorra [Neapolitan mafia], the Colombian cartels, the Russian mafia, met up and divided up the world," said a Belgian reporter who has investigated Fanchini for years but does not wish to be identified. 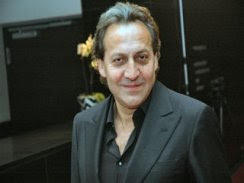 Born in 1956 in the industrial city of Katowice in southern Poland to a Polish mother and an Italian father who had himself grown up in the mafia-infested city of Naples, Fanchini fled to the West in 1977, settling first in Germany and eventually moving to the Belgian port of Antwerp. But he was one of several gangsters who returned to the East in the early 1990s to fill the vacuum left by the collapse of communism and became known as the Polish Al Capone. Polish journalist Jaroslaw Jakimczyk told the BBC: "He was one of the most dynamic of that group in the 1990s, and was linked with the Pruszkow Gang." The Pruszkow Gang dominated Polish organised crime, being responsible for the trade in drugs, stolen luxury cars from Germany and black-market vodka. Although their power was broken and most are now in jail or dead, Fanchini continued to prosper, partly because of his connections to Russian mafia bosses including Semion Mogilevich, who was a guest at his wedding, and arms smuggler Viktor Bout. He and his Russian partner, Boris "Biba" Nayfeld, set up an import-export business that traded in everything from cigarettes and chocolates to electronic goods. He also benefited from a tax exemption, for the importation of vodka into Russia, granted by corrupt officials close to the then President Boris Yeltsin. At the time he also bought a luxury yacht, the Kremlin Princess, and often turned up in Monte Carlo. Mobster Semion Mogilevich was a guest at Fanchini's first wedding But Fanchini lost powerful friends when Yeltsin left office, his company went bankrupt and he was prosecuted by the Belgian authorities for embezzlement and money laundering. While in prison serving a four-year sentence, Fanchini was dealt a further blow when a huge consignment of drugs was seized by the Dutch police. The 1.8 million ecstasy pills, weighing 424kg, were destined for sale to the US market, where Fanchini and Nayfeld had links with the Russian community in the Brighton Beach district of Brooklyn, New York. When Fanchini left prison he moved to London. In 2006 he hired out the Grand Hyatt Hotel in Berlin for a sumptuous party and followed it up with another bash in Moscow, which was attended by hundreds of gangsters as well as celebrities and legitimate businessmen. But Fanchini was living on borrowed time. In England he reportedly split his time between a Mayfair townhouse and a plush mansion in a gated community in Surrey, not far from the home of Formula One driver Jensen Button. But the US Drug Enforcement Administration (DEA) caught up with him and on the morning of 3 October 2007 officers from the Metropolitan Police's Extradition and International Assistance Unit knocked on the door of his townhouse in Mount Street. He was using the name Ricardo Rotmann, which was the surname of his third wife, Katja, a German, with whom he has a child. Fanchini had been identified by various European law enforcement agencies as an international criminal for years His second wife, Jolanta, is still in prison in Belgium after being convicted of money laundering. Fanchini made no attempt to fight extradition and in January last year he was handed over to US marshals at London's Gatwick Airport. He was due to go on trial later this year. According to the indictment, Fanchini's gang smuggled heroin and cocaine from Thailand to the US, via Poland and Belgium, for 17 years. The drugs were hidden in the back of televisions and eventually found their way to Brighton Beach and Staten Island in New York. But his attorney, Gerald Shargel, obtained a plea bargain and in November he pleaded guilty to a single charge - conspiring to distribute 424kg of MDMA (ecstasy) - and he now faces 10 years in jail. Journalist Vladimir Kozlovsky, who has covered the activities of the Russian mafia in New York for years, said: "The indictment was massive. He was accused of a million crimes going back 20 years. There were so many boxes of evidence that he had to have a separate cell to house it all. "The trial was due to last at least four months so, like 90% of cases over here, it was plea bargained and he could be out in seven years." Another former Fanchini associate, Viktor Bout, was arrested last year But the DEA has also hit him hard financially. Fanchini has agreed to forfeit $30m - $2m of which will have to be paid on the day of sentencing - and DEA officers have also seized more than 40 properties across the world with an estimated value of more than $67m. Nayfeld and two other co-defendants, Arthur and Nikolai Dozortsev, all pleaded guilty to laundering Fanchini's money. Speaking at the London School of Economics last year, the US Attorney General, Michael Mukasey, highlighted Fanchini as an example of close global co-operation in the fight against crime. He said: "Fanchini had been identified by various European law enforcement agencies as an international criminal for years. "It took a lot of co-operation and co-ordination between the US, UK and other countries to bring about his arrest. "Detective Inspector Paul Fuller, head of the Metropolitan Police's Extradition Unit said: "We work tirelessly to ensure that those wanted for crimes are brought to the justice system. It is important that Londoners know that we are arresting and extraditing foreign criminals on a daily basis." Dominique Reyniers, of the Belgian Justice Department, confirmed Fanchini was also the subject of a separate investigation into alleged money laundering in Antwerp. It is thought that inquiry looked at property investments he made in the Ukrainian resort of Odessa. Fanchini's friends Mogilevich and Bout have both been arrested in the past year and he himself will be in his 60s by the time he comes out of jail in the US. Clinton Shawn Martin Jr., 24, of 31 E. Market St., Harrisonburg, was arrested in early January. Police say Martin is a local leader of the Gangster Disciples, specifically the six deuce trey set, according to multiple search warrants filed in the case by a CHARGE Gang Task Force investigator.Martin was one of four people arrested in January in connection to a two-year gang investigation. 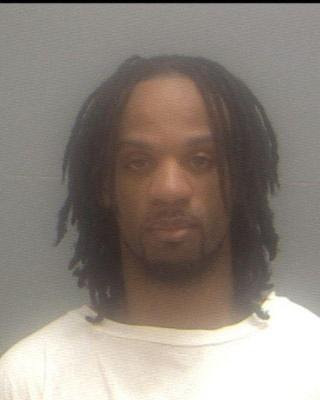 He was arrested on Jan. 15 as he attempted to trade drugs for guns in the Roses parking lot on Mason Street.Martin faces 46 charges, including drug distribution, firearms violations and gang participation. "[The Gangster Disciples] are probably one of the more prevalent gangs in this area," said Lt. Kurt Boshart of the Harrisonburg Police Department. "They're probably one of the most organized." Randy Crank, president of the Virginia Gang Investigators Association, a group that provides resources and training to local law enforcement agencies, said Harrisonburg's gangs are most likely independent groups and have no official affiliation with the major gangs or their nationwide network of chapters. "What you have is homegrown," said Crank. "They will use the national gang signs, symbols, colors and hand signs even though they don't have any ties nationally. "Boshart said Martin grew up in Harrisonburg, but might have had some ties nationally.Crank said Gangster Disciple members, or those claiming to be members, can usually be identified by the use of a three-pointed pitchfork and six-pointed star in "taggings," or graffiti, and other materials. They also go by the numbers "74" - a reference to the seventh and fourth letters of the alphabet, "G" and "D", he said. Boshart said this case, and several recent cases, show that gangs exist in the Shenandoah Valley and are growing. "We're seeing a steady progression unfortunately," he said, adding that it's getting more violent. A few years ago, he said, he would tell people that there was some gang activity, but it was rarely an issue and even when it was, it rarely turned violent. But that's changed, he said. "Last year, we could say at least we didn't have a murder," said Boshart. "Unfortunately, we can't say that now. "Boshart was referring to the shooting of Reginald "Shay" Nicholson, 19, of Staunton. Nicholson was mortally wounded on Nov. 9 after he left a party at an apartment in the Hunters Ridge complex off Port Republic Road. Nicholson died 12 days later at the University of Virginia Medical Center.Police say the killing was gang-related, pointing to witness statements that say a group of people entered the apartment prior to the shooting yelling "Bloods in the house." As gang activity becomes more violent in the Valley, police say local residents need to step up. "Gang activity is a community issue that the community needs to get behind," said Boshart.He said it needs to be a collaborative effort between the educational, business and faith-based communities, as well as public safety agencies and parents. "Everybody plays a part," said Boshart, adding that residents need to report what they see. "If you're driving down the road and see some suspicious gang activity and say ‘We'll just let the CHARGE Gang Task Force handle that,' we've lost. The community has lost. "Boshart said continuous education is the key to ending gang activity. "Everybody has to stay educated, especially if you're dealing with children," said Boshart. "What we learned last year might not apply this year." Confiscated almost €300,000 from the assets of major gangland figure Michael "Roly" Cronin, who was murdered in the centre of Dublin last month.The money was handed over after a High Court decision yesterday afternoon.The Cab was granted a freezing order against Cronin in March 2001 after it seized three properties at Buckingham Street in the north inner city; Ballyboden, Rathfarnham; and Finebar-Fort, Wellmount Road in Finglas.The houses were subsequently sold by the receiver on behalf of Cab and following the statutory seven-year wait, an agreement was reached in court yesterday in which two sums of cash, €103,000 in one bank account, and €180,000 in another, were officially handed over to the Finance Minister.Also in the High Court yesterday, the Criminal Assets Bureau secured an order handing over €38,662.75 to the State.The money was the proceeds of drug trafficking by Cab target Michael Shannon, who gave an address at Minart House at Sligo Road in Longford.The cash was seized as part of a search of a house at Bishopscourt in Ennis, Co Clare and was subjected to a freezing order for the past seven years.Shannon, who then had an address at Lenihan Avenue, Prospect, Limerick, was sentenced to eight years in prison after he pleaded guilty at Limerick circuit court in October 2002 to possession of 100,000 ecstasy tablets with a street value of more than €1m.A third convicted drug trafficker also fell victim to the Cab in the High Court yesterday afternoon.The court heard that Stg£22,000 was seized from Kevin McEvoy, of Ajax Court, Townspark, Antrim, as he attempted to board a flight to Amsterdam in February 2007.The court was told that McEvoy had 48 criminal convictions, including some for drug trafficking.The Cab secured a consent order to confiscate a total of €31,995.28. Ian "Blink" McDonald has been banned from every prison in Scotland. Ian "Blink" McDonald has been banned from every prison in Scotland. The bank robber was blacklisted after he hurled abuse at a warder while visiting a murderer friend in jail. A source said: "Blink's still got a lot of friends in prison and some of them are serving long sentences. "He's gutted he won't be able to visit them and was furious when he was told he's banned from every prison. "He's spent half his life trying to stay out of jail, now he can't get in...but he isn't seeing the funny side. "He'll have to get another conviction before he manages to see his old pals anytime soon." McDonald, 47, was visiting a pal with Paisley gangster Grant Mackintosh when the bust-up happened at Glenochil Prison, near Stirling. Mackintosh recognised a warden he had a run-in with while serving time in Glenochil almost 20 years ago. The officer burst into tears when the pair targeted him for threats and abuse. McDonald was arrested and fined £200 for breach of the peace following the incident in October. Bosses barred him from all 16 Scottish Prison Service jails after a meeting which pin - pointed potential troublemakers. They have in formed McDonald he will not be able to visit any of his banged-up cronies. McDonald was jailed for 16 years in 1992 following a botched £6million bank robbery in Torquay. A teller was shot in the head during the raid. McDonald was released after 10 years. He was also sentenced to six months for assaulting a prison officer while on remand in Barlinnie in 1986 for attempted murder. The SPS said: "Intelligence is sent to each governor each time there is a incident with a visitor. "It's at the governor's discretion whether to refuse someone entry." Memoirs by the notoriously violent jailbird Charles Bronson, the Krays, and former drug smuggler David McMillan's Escape, which tells how he broke out of Thailand's Klong Prem prison.The party also criticised prison libraries for stocking the autobiography of "mad" Frankie Fraser - the legendary gangster who was a peer of the Krays - and bare knuckle fighter/armed robber Roy Shaw's Pretty Boy, as well as Hitler's Mein Kampf. "Jack Straw has said that he wants to prevent criminals from profiting from their memoirs, yet prison libraries have been purchasing their books to lend to other criminals," said shadow justice secretary Dominic Grieve. "It beggars belief that books glorifying crime and violence are being made freely available to prisoners. "Party research also found that inmates in HMP Erlestoke in Wiltshire are able to borrow books including Nine Lives by Bill Mason, subtitled "confessions of a master jewel thief", Charles Bronson's memoir Bronson, Pretty Boy by Roy Shaw and Dennis Stafford's Fun-loving Criminal, subtitled "the autobiography of a gentleman gangster".Gloucester Prison library, meanwhile, stocks Gitta Sereny's Cries Unheard: the story of Mary Bell, Charlie Kray's Doing the Business and former gangster Dave Courtney's Dodgy Dave's Little Black Book. "Whitey" Bulger.on the run for 14 years wanted for the murders of 19 people. "Whitey" Bulger. Bulger has been on the run for 14 years wanted for the murders of 19 people. F.B.I.doubling the reward for information leading to his capture to $2 million.Bulger, the former head of the notorious Winter Hill Gang and an FBI informant, fled in January 1995 after being tipped by a former Boston FBI agent that he was about to be indicted on federal racketeering charges. He was later charged in connection with 19 murders.The FBI announced the new reward on Wednesday with federal prosecutors, state police and state prisons officials. 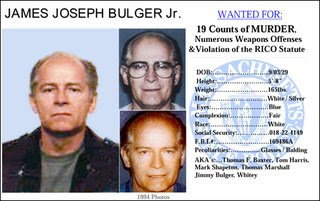 Bulger , on the FBI's "Ten Most Wanted" list, provided the FBI with information on his gang's main rival, the New England mob, in an era when bringing down the Mafia was one of the bureau's top national priorities.Authorities say that the last credible siting of Bulger was in London back in 2002. Bulger sits next to Osama Bin Laden on the FBI's ten most wanted list. On Tuesday, special agents from Boston flew to Washington to meet with members of the foreign press, trying to generate an international buzz about the 79 year-old gangster.Authorities are hoping someone will recognize Bulger or his travelling companion Catherine Greig and contact them. Bulger is considered a source of embarrassment for the FBI after it was revealed the South Boston gangster had a cozy relationship with FBI agent John Connolly. Bulger and his crew continued to commit crimes during the ‘80s and ‘90s all while under the protection of the feds as a government informant.Connolly is now serving ten years in a federal prison for tipping off Bulger to a pending indictment. The government is offering a $2 million dollar reward for the fugitive’s capture. mafia group, connected to the Casalesi Clan was discovered after two years of investigation by the Roman branch of the Carabinieri. The criminal organisation was operating in the southern part of Lazio, illegally acquiring numerous commercial activities, mostly car dealers, that were gathering enormous patrimonies. 40 arrest warrants were released form people accused of association with the mafia, money laundering, fraud, extortion, falsified invoices, tax evasion worth millions of Euros and fraudulent transfer of goods. Over 500 agents from the Carabinieri were involved in the investigation in the provinces of Rome, Latina, Frosinone and Caserta. Numerous seizures are in progress in different areas of Italy and abroad of goods and businesses controlled by the criminal organisation worth over 80 million Euros. Accountant Stephen Corso was in deep trouble. His clients, including longtime friends, told federal authorities in Connecticut in 2002 that he had stolen more than $5 million.Then the Ridgefield man who loved to gamble took the biggest risk of his life: He decided to become an FBI informant in Las Vegas, known as an open city because the Mafia felt it could operate freely.Corso’s fateful decision came as federal agents in New York were struggling to build a case against two former police detectives long suspected of collaborating with the mob. Investigators were dealing with uncooperative witnesses and a statute of limitations.After a secret meeting with an FBI agent at a hotel, Corso was fitted with a wire and went to work taping conversations of suspected mobsters from around the country. He would spend years recording conversations on more than 900 tapes as he lived a transient life sleeping on the couches of friends, including what authorities called some unsavory characters.“We came across anything and everything,” said FBI agent Kevin Sheehan. Soon Corso was introduced to Louis Eppolito, one of the detectives suspected of carrying out mob hits.“It was divine intervention,” Robert Henoch, a former New York prosecutor who handled the case, said at Corso’s sentencing Tuesday when he received a year in prison. Or maybe it was dumb luck, he added.Either way, Corso began to fill in the holes in the case. The former detective bragged about dunking someone’s head in acid and threatened to decapitate another person, Henoch said.At one point, Corso was threatened with execution if he turned out to be an informant, authorities said. He had no backup as he secretly recorded the conversations. “I don’t think he would have lived too long in Las Vegas or anywhere,” Sheehan said. Corso offered the detectives drug money to finance a film project at a 2004 meeting in Las Vegas. Eppolito, a decorated former detective and son of a mobster, was living in Las Vegas and trying to peddle screenplays and was unconcerned about the source of the cash.Eppolito and the other detective, Stephen Caracappa, were accused of participating in eight mob-related killings between 1986 and 1990 while working for the Luchese crime family in one of the worst cases of police corruption in New York history.A New York jury found the detectives guilty in 2006, but a judge dismissed their racketeering case after determining the statute of limitations had passed on the slayings. A federal appeals court later reinstated the verdict after prosecutors argued that the murders were part of a conspiracy that lasted through a drug deal in 2005 with Corso.“There never would have been justice without Mr. Corso’s cooperation,” Henoch said.Corso’s intelligence led to other prosecutions and saved investigators millions of dollars, authorities said.Authorities said they offered to put Corso in a witness protection program, but he declined because he would not be able to see his wife and three children.Corso, who faced the possibility of more than seven years in prison but won the reduced sentence for his extraordinary cooperation, is scheduled to surrender May 6.Susan Patrick, whose family lost more than $800,000 to Corso, said he was a family friend before the thefts. Corso has been ordered to pay restitution to the Patricks and other victims. “This started a six-year nightmare,” she said at his sentencing. “We will never be whole for our losses. I don’t believe Mr. Corso is at all sorry.”Corso, who apologized to the victims and his family, said at the time that he ripped off millions from his clients to finance a life of “girlfriends, jewelry and going out.” Prosecutors say he also had significant gambling losses while living a second life in Las Vegas.Corso told the judge his parents were first-generation Italian immigrants who struggled so that he could have a better life. His family, who helped pay for his education at New York University, hated the mob, he said.“And I threw it all away,” Corso said. “I simply lost the way I was raised, how I was raised, but I know for the last six years I functioned and there was never a moment, never a second, that I ever considered doing anything wrong.”Authorities say Corso remains in danger because of his cooperation with them.“Mr. Corso will live the rest of his life with a target on his back,” said his attorney, J. Bruce Maffeo. Most feared gangsters in Edmonton, a high-ranking lieutenant in Redd Alert with the street name Crewboss. Now he's a bedridden paraplegic living in a city hospital, the victim of a vicious swarming by his own gang that put him in a coma for weeks. "For the past two years, he's just been lying here like this," says his older brother, Andrew Reid. "He's not getting any physical therapy. They told me he's too violent to work with, but look at him. What could he possibly do?" A spokesman for the hospital (the location won't be revealed for security reasons) was not able to explain yesterday why Sinclair has languished there for two and a half years, at an estimated cost of $1,400 per day. Sinclair's feet, legs and right arm are slowly bending and twisting as his muscles atrophy. He has only partial use of his left hand and he's subject to involuntary ticks and twitches. Reid, 51, who helped raise his brother, wants Sinclair to get some therapy so some day he will be well enough to move out of Edmonton, change his identity and start life over away from gangs. "If we can get him in a wheelchair, we can take care of him," Reid said. "They could still come after him and finish him off." "I want to work," Sinclair says with a broad smile and thumbs-up. Reid gives Sinclair a hug. "He was such a happy kid, always smiling. And funny. He loved to laugh." Things began to unravel, Reid says, when Sinclair fell in with a rough crowd as a teenager. At age 22, he was sentenced to eight years in prison for aggravated assault for a fight in Boyle, 100 km north of Edmonton. He was sent to the maximum-security Edmonton Institution, home to some of the most dangerous criminals in Canada. "I knew it was going to be bad for him," Reid says. "I warned him. Keep your head down and stay away from the gangs." Six years into his sentence, Sinclair called Reid to proudly tell him he had joined Redd Alert and was moving up the ranks. "He was really pleased with himself," Reid recalls. "Things just kept getting worse after that." In 2004, Sinclair was charged in connection with a brutal robbery of a 77-year-old man lured to a downtown apartment by a prostitute. Sinclair was accused of waiting at the apartment, then pulling a gun on the victim and smashing out his teeth with it until the man gave up his bank card and PIN number. Sinclair was in the Edmonton Remand Centre waiting for his trial on those charges in May 2006 when he was swarmed by up to 10 other Redd Alert members. Reid says they wanted to get rid of Sinclair because someone wanted to take over his position in the gang hierarchy. "He wanted out anyway," says Reid. According to testimony at three of his attackers' trial, Sinclair got into a fight with Johnny Jacknife, another RA member. It was broken up but later flared up again in Sinclair's cell. Two more men joined in and Sinclair was knocked to the ground. Several others streamed into the cell and kicked him while he lay unconscious. Sinclair was rushed to hospital, where he clung to life with a severe brain injury. He's been in hospitals ever since. The charges in connection with the robbery were stayed. "Now he's stuck here in limbo," Reid says. "Maybe if we can get him well enough, he can still make something of himself. All that time he spent in jail just made him angrier and more violent. He's not the same guy. He wants to do something good." "I was bad," Sinclair says, giving another thumbs-up. "I'm not any more." sentenced James Marcello on Thursday after a federal jury held him responsible for the deaths of Tony "The Ant" Spilotro and his brother Michael. Reputed Chicago mob boss convicted in the murders of the organization's Las Vegas link and the man's brother has been sentenced to life in prison.U.S. District Judge James B. Zagel sentenced James Marcello on Thursday after a federal jury held him responsible for the deaths of Tony "The Ant" Spilotro and his brother Michael. Tony was the inspiration for Joe Pesci's character in the movie "Casino. "Marcello was convicted in September 2007 with four others in the landmark Operation Family Secrets trial.Zagel says Marcello had to pay for his crimes.Marcello declined to address the court before he was sentenced.Former police officer Anthony Doyle is the last defendant convicted at the trial who has yet to be sentenced. Genovese soldiers reportedly took over the businesses after the owners could make their payments on loansharking debts. In the state of New York it has become common place to have police bust up mafia operations. It occurred again on Wednesday when thirteen alleged members of the Genovese crime family were charged with various crimes. Gambling, as it is in most mafia cases, was at the forefront of the charges. The indictment that was unsealed refers to the "operation of illegal gambling businesses." The men were also charged with extortion, narcotics trafficking, and loansharking. Of the thirteen people that were charged, six of them were arrested early Wednesday morning. The other seven were either in the process of turning themselves in or were already in custody from other charges. Among the arrests was a former acting boss for the Genovese crime family. Several of his soldiers were also picked up in the raid. Thomas Tassiello, another Genovese family member was charged in a separate indictment on charges of extortion and racketeering. The sting stems from the crime family shaking down local businesses, mainly bartending school owners in both Jersey City and Manhattan. Genovese soldiers reportedly took over the businesses after the owners could make their payments on loansharking debts. Colombia's most-wanted drug lords has offered his gunmen nearly $1,000 US for every police officer they murder in a major coca-growing region, a senior official said on Friday.National police chief Gen. Oscar Naranjo said Daniel Rendon, known as Don Mario, had made the offer in a bid to halt police operations targeting his drug trafficking ring and coca crops in the hills of Antioquia province. "When a criminal gives an order like Don Mario's, to pay two million pesos for the death of each and every one of my police officers, I know my officers are fulfilling their duties," Naranjo told local television.Colombia's most infamous drug lord Pablo Escobar, who was shot dead by security forces in 1993, used a similar strategy in the 1990s and his hired gunmen killed dozens of police officers in Medellin, Antioquia's main city.Rendon is one of the three most-wanted drug traffickers in the Andean country, the world's biggest cocaine producer, and authorities are offering a reward of up to $2.2 million for information leading to his capture. He belonged to one of the paramilitary groups that began demobilizing after a 2003 peace deal with the government of President Alvaro Uribe, but he refused to confess his crimes as required under the accord and went into hiding.Early last year, Rendon's group kidnapped 25 men he had accused rivals of sending to kill him in a turf war.Uribe has sent troops to secure areas once controlled by armed groups and violence has ebbed, but leftist rebels and former paramilitaries still battle for control of the nation's vast cocaine trade. Police in New York have arrested 13 alleged Mafia gangsters believed to be involved in various crimes including racketeering, extortion and cocaine distribution.Most detainees are suspected members of Genevese organized crime family.They are facing lengthy sentence if found guilty.The arrests, trials, inner bickering and turncoats in mafia organization, have weakened the five mafia crime families in New York, including the Bonnano, Colombo, Gambino, Genevese and Luchese.